Since the first day I opened the records for the village of Maia on Sao Miguel Island, Azores, I was aware that there were two Braga families. One was mine. The other family went by Braga Serra. They seemed to be two completely different families. So, I followed mine and ignored the others. That turned out to be a mistake. The two families are one and the same. Thanks to digitization of Azorean church records, this time through I’ve been researching at my leisure from the comfort of my home. Much easier on the eyes and the shoulder that the old microfilm reader I used to slouch over. Plus the library isn’t open for me at midnight. A little background information. My ancestors Joao de Braga and Maria do Espirito Santo were married on the 8th of October 1800. While I knew both of their parents, I didn’t know when they were born. With the help of another researcher, I located Maria’s information. I had no luck finding Joao. But, as I fiddled around in the records from the 1750 to 1800, something became clear. There weren’t a whole of people with the surname Braga living in Maia. In fact, it was beginning to look like there was only one family…at least in the 1700s. By flipping back to the baptismal records for the 1740s and 1750s, I confirmed it. 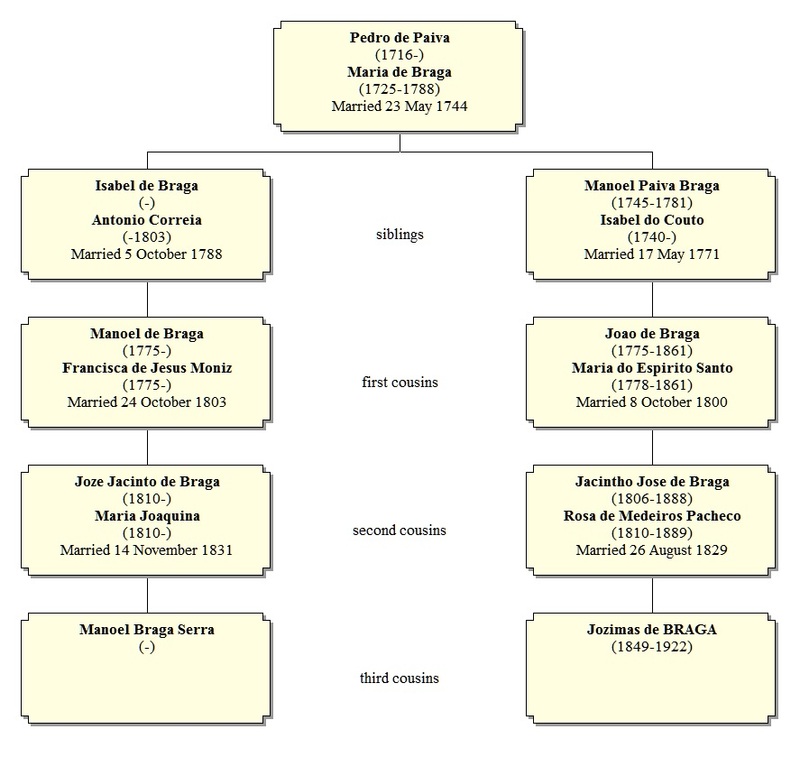 Almost all the de Braga children born in this time frame belonged to one couple, Pedro de Paiva and Maria de Braga. Maria’s parents were Damiao de Braga and Barbara Faria. Damiao was from Fenais da Vera Cruz (now known as Fenais d’Ajuda) and Barbara was from Estrela. Some of their children were born in Achada and some in Maia. Of the 4 who raised their families in Maia, one line used Monis, Moniz Thomas, and Moniz Tracado. The second line used Pacheco. The third line was known by Carreiro. My ancestor’s childen took the surname Paiva Braga which was shortened by the next generation to de Braga. The is only one Braga lines in Maia that does not lead back to my ancestors–and that line leads back to Damiao and Barbara. Where Do The Braga Serra Fit In? If Pedro de Paiva and Maria de Braga were the source of the Braga surname in Maia, where did the Braga Serra fit in? Were they from another village? Did one of Pedro and Maria’s descendants adopt an alcunha or nickname? The answer was in the mid-1850s. At the start of this article, I mentioned Joao de Braga who married Maria do Espirito Santo. Joao was the son of Manoel Paiva Braga and Isabel do Couto. Manoel Paiva Braga had a sister, Isabel de Braga. She married Antonio Correia on the 5th of Oct 1788 in Maia. They had at least one son, Manoel de Braga. This is another example of the maternal surname being carried down. If we follow the records from Manoel’s line to his son, Joze Jacinto de Braga, we slam right into the Braga Serra. It was Joze Jacinto’s son, Manoel, who adopted the Serra surname sometime in the 1850s. Starting at that point, the descendants of the line were known by Braga Serra. After 1900, the surname split between Braga and Serra. What’s The Relationship to Me? I need Peabody and Mr. Sherman to take us back in the Wayback Machine to understand this one! Manoel Braga Serra was in the same generation as my great great grandfather, Jozimas de Braga. Jozimas was born in 1849. Jozimas and Manoel were 3rd cousins. 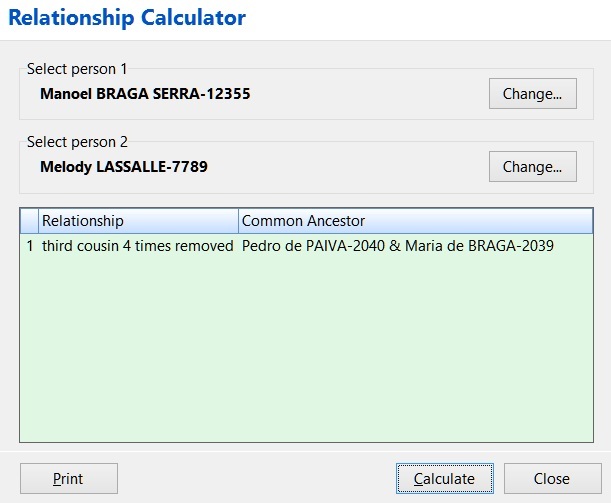 According to the nifty relationship tool on RootsMagic, this makes Manoel and me, 3rd cousins, 4 times removed. I wish I had known this in the 1990s when I worked my way through the microfilm for this village. After I made the assumption that the Braga Serra were a different family, I stopped taking notes from their records. Now I have to backtrack and fill in the missing descendants. On the plus side, I now have Braga Serra cousins in the Azores, Canada, and the United States. Adding Serra to the Braga surname is like an alias in French naming patterns and farm names in Scandinavia. It might have been done to distinguish too many men with the same given name, identify those with a certain occupation or even because of a family feud. Emptybranches, Thanks for your comments! I believe the use with the Portuguese is similar. They are usually referred to as alcunhas. They are given as nicknames that describe the individual, their occupation, their location, and so forth. Then, they are passed down to offspring. Sometimes, as you said, they are used to distinguish one family from another. Hey I know this was posted a long time ago but I’m just starting research on my family history and I traced back through my father to Manoel Braga Serra and got stuck.. I guess what I’m saying is I’m his great grandson living in America!